Easter table. 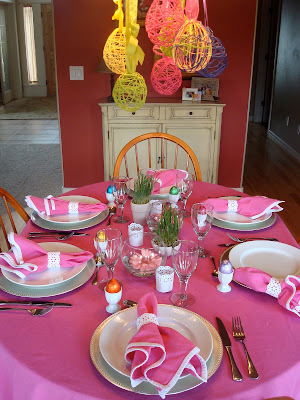 I usually like to decorate my table in pastels for Easter but this year I wanted to go bright so I could match the string eggs we made earlier. Eyelet napkin rings and candle holders matched the trim on the napkins nicely. Cemoi eggs looked great in the egg cups (thanks Janette) which matched beautifully with the string eggs. Gerber daisies looked great in round vases with clear pebbles. I added grass in little pots that I got at Ikea (the same pots I used here and here). I planted the grass a week before so it would be long enough for decorating. I thought the table turned out nicely...now onto the Royal Wedding and Cinco De Mayo! 0 Response to "Easter Table"